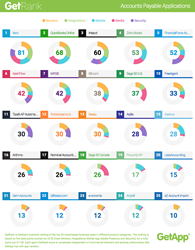 GetApp has updated its ranking of the top 25 accounts payable apps in the cloud for Q1 2016. Xero headed the field, with QuickBooks Online in second place, and Intacct in third. GetRank was designed to make the process of choosing a cloud-based app easier for small and mid-sized businesses. Its ranking system incorporates five criteria: user reviews, integrations, mobile apps, media presence, and security. Each element carries a maximum mark of 20, with 100 being the top score any app can achieve. The user review score is calculated using the number and rating of reviews of each app on GetApp, while the integrations scores is worked out using the number of apps each piece of software integrates with. Media presence counts the number of Facebook fans and Twitter followers each app has, while the mobile app score is drawn from the availability and user rating of a mobile app in the Google Play and Apple App Store. The security score is formed by using data provided by vendors in response to a GetApp survey based on the Cloud Security Alliance Self-­Assessment Form. QuickBooks Online dominated the mobile app category with a maximum score of 20, while Bill.com was the user favorite, taking full marks for its user reviews. Sage 50 U.S and Sage 50 Canada excelled in social media presence, scoring a perfect 20, and Tipalti AP Automation came out on top in security, with a score of 17. Integrations, a key factor for accounts payable apps, was once again dominated by QuickBooks Online, who had a perfect score of 20. For more information, check out the entire Q1 2016 GetRank of accounts payable solutions. You can also download a free copy of our report, Accounting in the Cloud, which includes input from industry experts on trends in accounting and accounts payable software.